Late last week I watched the news in utter disbelief and horror. Yet again. Yet again, our President showed us who he is: ignorant, entitled, unintelligent and above all, yes, a racist. I won’t belabor the point on his utter incompetency too much because it is on full display every day but his comments about immigrants from “shithole countries” really struck a nerve. I am descended from immigrants. Chances are extremely high that you are too or maybe you’ve immigrated to this country. The President himself is descended from immigrants and at one point or another, those countries from which our relatives came, from which we hold vast amounts of pride, were probably considered shitholes too. No doubt about that. All four sets of my great grandparents came from Poland and Czechoslovakia during the Slavic migration and just like now, they faced discrimination from the wave of immigrants that came before them. Getting here first doesn’t make anyone more entitled or a better person. Argh, it makes me so angry. The curious thing in the middle of this outrage is that I was actually inspired. After weeks of fighting a nasty bug and having zero ideas for this blog, the utter foulness of this President gave me some ideas. Go figure! In a rare glass half full moment, I took a good hard look at myself and admitted I didn’t know much about these supposed “shithole” countries: Haiti, El Salvador and the 54 nations that comprise Africa. Though I’d bet my life that this President doesn’t know Africa is a continent, not a country, and is composed of 54 vibrantly different nations. That my friends would be a sucker bet. The more I read, the more I realized that to call these countries “shitholes” is woefully ignorant of the roles we, the US, has played in their histories. It’s pretty terrible across the board. The more I read, the more depressed I became until I came across something that always peaks my interest: the food. Food sustains a nation. It brings people together, it is instrumental in many a small business and not only nourishes our bodies but our souls. This holds true for every culture. So I started looking into the food of these countries and came up with an idea. My next several posts are going to explore these things. Let’s look at the foods of Haiti, El Salvador and some of those 54 African nations a little bit. Energized, I immediately thought of a picture of some sort of pockmarked flatbread that I saw in Saveur magazine a while back. What was it? I had a vague memory of it being African or maybe Middle Eastern, a simple batter cooked in a skillet. Now, where was it? I started digging through my stacks of back issues but quickly defaulted to the ease of the internet. 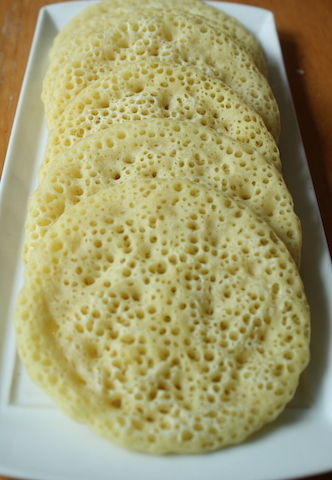 Within minutes I had found the recipe in the Saveur digital archive: Baghrir or 1,000 Hole Crêpes. 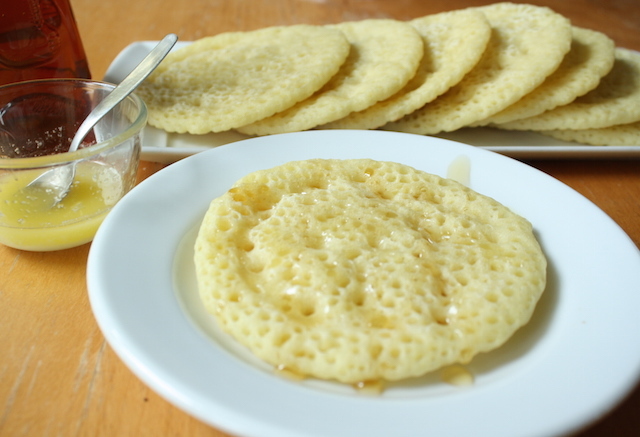 Baghrir are yeasty, pancake-like breads, cooked on one side and topped with hundreds of little holes (hence the name – 1,000 Hole Crêpes), all the better to capture the butter and honey with which they’re served. They are popular for breakfast in the African countries of Morocco, Tunisia and Algeria. I had never heard of these cakes before and was completely intrigued. A perfect start for this little project. Overall, this is an incredibly simple recipe but there are some quirks. First, you have to get your hands on some fine semolina but I found it easily in my regular grocery store (Bob’s Red Mill). Next you need a little time – a 10 minute blend then a good 2 hours for the lightly fermented flavor to develop. The technique is just like making pancakes but easier because they’re no flipping involved. The lightly bubbly batter is poured into a heated nonstick skillet – no butter, no oil – and left to it’s own devices for a few minutes. Bubbles form, rise to the top and pop as the crêpe slowly cooks. This is a completely mesmerizing process, watching the bubbles inch to the surface and pop creating a cratered top of nooks and crannies. As recommended, I put them in a warm oven to hold while I finished off the batter. So how are they? Good! Really really good. 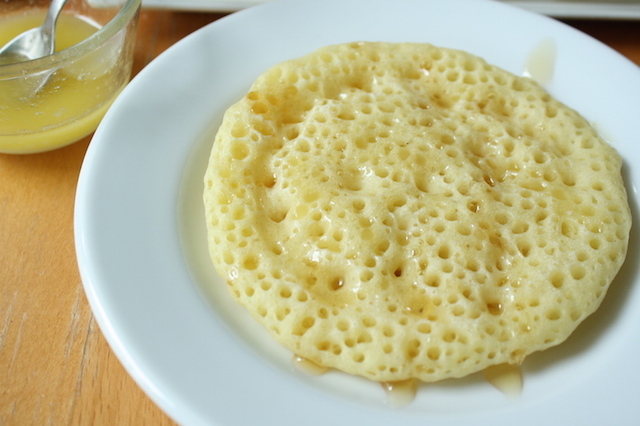 While they’re called crêpes, they are closer to a flat crumpet than the traditional French crêpe that we know. The flavor is ever so slightly tangy from the fermentation – not sour per se but with a nice twinge that is quite interesting. They’re slightly crispy-chewy on the bottom but light and fluffy on the top with all those little holes perfectly cradling the butter and honey without becoming soggy. Traditionally served for breakfast with butter, honey and maybe jam, I think they’d be really great with a soupy stew to soak up the juices. It may not be traditional but they’d make an excellent substitution for blinis with a bit smoked salmon. This is a great introduction to Moroccan food that’s outside the expected norm. While making these, I was reminded of how much immigrants contribute to the fabric of our country and how much better we are for their contributions. Take a second to think about how boring our own cuisine would be without the influences of our immigrant history. Because really now, what is America if not an amalgamation of it’s citizens? STRESS THERAPY BAKING FACTOR: RESISTANCE THROUGH FOOD. It is human nature to fear that which we do not understand. By learning more about these unfairly maligned cultures through their histories, through their cuisines, we can create a better understanding of their realities. Sure it’s just bread but maybe the next time you meet a Moroccan, Algerian or a Tunisian you’ll have something to talk about. Connecting is just the first step toward greater understanding. Works for me all the time. My oven is old and finicky and doesn’t go to a very low temperature. I set it on the lowest setting – 200°F it tells me – then turned it off completely halfway through cooking the crêpes. This worked pretty well in keeping the completed crêpes warm without drying them out. In a blender, combine the semolina, flour, yeast, salt, and water and blend on the lowest speed (I used low #2 on my VitaMix) for 6 minutes (the long blending time allows the semolina to become finely ground so it thickens the crêpe batter). Scrape the blender with a rubber spatula about 2 minutes in as the semolina has a tendency to settle on the bottom in a thick paste. Add the baking powder and continue blending for 4 more minutes. Pour the crêpe batter into a medium bowl, cover with a kitchen towel, and let stand at room temperature until foamy, about 2 hours. Heat the oven to 180°F and line a sheet pan with a kitchen towel. Heat an 8” nonstick skillet over medium for 2 minutes. Whisk the crêpe batter to ensure it is well mixed and pour 1/3 cup of the batter into the skillet. Do not tilt the pan – just pour the batter in a nice round circle like making a pancake. 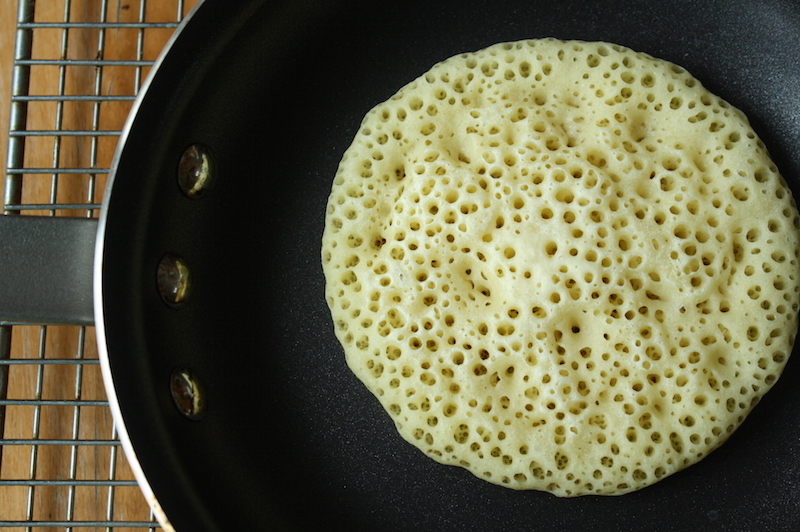 Cook the crêpe, undisturbed, until holes set on the surface and the crêpe has no more wet spots, 3-4 minutes. Transfer the crêpe to the sheet pan and keep warm in the oven while you cook more crêpes with the remaining batter. When ready to serve, arrange the crêpes on a serving platter and serve hot, drizzled with melted butter and warmed honey or whatever you like. Talk about nooks and crannies. I know the rest of my family would be up for the butter and honey topping, but I’m thinking of something like a chicken stew. I’m looking forward to this series. on January 16, 2018 at 12:16 pm | Reply Monsieur R.
Excellent read, Stress Cake! The recipe sounds like Injera from Ethiopia/Eritria. I cant wait to try it on the savory side. Not as soft and foldable – its got some chew. More like a flat crumpet but delicious all the same. Yes, yes, yes, yes. What a pleasure to share this post on Facebook. Thank you. Have you heard of the cookbook Feed the Resistance? by Julia Turshen.